This past Spring I purchased heirloom tomato plants at the Sand Springs Herbal Affair & Festival along with a handful of other peppers and herbs. My vegetable garden is small, some planted in-ground and others in pots. This morning while watering the tomatoes, my thinking had me wondering if the cost of the water had exceeded the benefit of the small crop that made in this heat and drought, heat such that I've covered the tomato plants with old sheets to give some relief from the scorching sun to try to save the plants and just maybe get a fall crop. Your home needs care and nurture as does your garden. You may live in your home many seasons over time. Throughout that duration there will be maintenance needs and possible upgrades. All this work may help get that extra boost in value and quick sale when the time comes to sell your home. 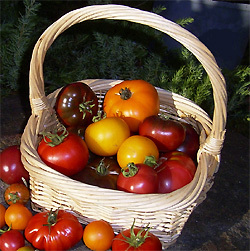 Just like the diligent watering of heirloom plants yields a good crop so can care of your home, as if it were a valuable heirloom, yield pride and benefit from your work.